Chocolate lava cakes are best known for the soft "molten" centers that ooze at the first spoonful. Already one of the simplest, but most impressive desserts out there, the cakes are even easier to mix and cook in an Instant Pot pressure cooker. 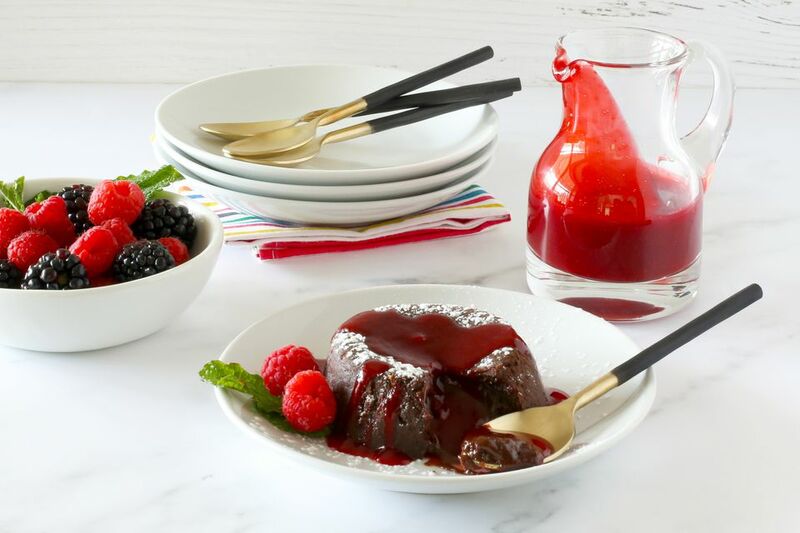 The included raspberry sauce is the perfect topper for the rich molten lava cakes, and it takes just a few minutes to fix up on the stovetop with frozen raspberries. Feel free to prepare the sauce a day in advance and refrigerate it until it's time to serve dessert. Or you might choose to skip the sauce and sprinkle the lava cakes with sifted powdered sugar. Warmed fruit jam, peanut butter sauce, or butterscotch sauce are excellent options as well. Note: while there are multiple steps to this recipe, the raspberry sauce and cakes are broken down into workable categories to help you better plan for preparation and cooking. Combine the granulated sugar and cornstarch in a saucepan. Stir to mix well. Add the frozen raspberries and lemon juice to the saucepan and place it over medium heat. Bring the raspberry mixture to a simmer; cook for about 1 minute, or until thickened and smooth. Press the raspberry sauce through a mesh sieve; discard the seeds and pulp. You should have approximately 2/3 cup of seedless raspberry sauce. Put the sauce in a covered container and refrigerate it until you are ready to serve. Bring 1/2 cup of water to a simmer in a medium saucepan or bottom of a double boiler. Combine the chocolate and butter in a bowl or top of a double boiler. Place the bowl or pan over the simmering water and cook, stirring, until the mixture is melted and smooth. Remove the melted butter and chocolate from the heat; add the powdered sugar and whisk until blended. While the mixture cools, grease four 6-ounce ramekins with a small amount of softened butter or spray them with nonstick cooking spray. Dust the greased ramekins lightly with flour, shaking off any excess. In a medium bowl, whisk together the eggs and egg yolk. Add the beaten eggs to the cooled chocolate mixture along with the flour, salt, and vanilla. Whisk until smooth and well blended. Divide the chocolate cake batter among the four ramekins. Place the Instant Pot trivet/steam rack in the pot and add 1 cup of water. Cover the ramekins tightly with foil and place them on the trivet. Place three ramekins on the trivet and stack the fourth in the center atop the bottom three. Lock the lid in place and make sure the vent knob is set on "sealing." Select the manual setting, high pressure, and then set the timer to 9 minutes. When the time is up, quickly release the pressure. Carefully remove the ramekins from the cooker and set them on a rack. Let them cool on the racks for 4 minutes. Uncover the ramekins and serve them immediately—in their ramekins or unmolded—with the raspberry sauce. To invert them onto dessert plates, first run a thin, sharp knife around the inside of the ramekin. Place a dessert plate over the top of a ramekin, flip it over, and remove the ramekin. Add a garnish of fresh raspberries and mint, if desired, and enjoy! The chocolate lava cakes only take nine minutes to cook in the Instant Pot, but plan on an extra six to eight minutes for the pressure to build and four minutes of cooling time.